It’s 1:30 in the morning under a moonless West Texas sky right in the middle of nowhere. She’s 19 years old, on her first hunt where the animals actually show up. She’s been around guns her whole life. Her dad has hunted and killed plenty of hogs in these very fields over most of the last decade. She didn’t even know she was coming along tonight, but here she is, behind a 300 Blackout Bushmaster Minimalist kitted up with a Sightmark 3-9x scope paired to a Pulsar Core thermal clip-on/monocular. My daughter Lauren is looking at a group of about 25 hogs and another group of 30 beyond them. If you’ve ever heard the expression, “The cobbler’s children have no shoes” you understand where this is going. When we’re around something all the time we have a tendency to under appreciate its significance. To my kids, Tactical Hog Hunting is something Dad does, so what’s the big deal? They’ve seen the pictures, they’ve helped photograph and video crazy cool guns and gear. They occasionally get used as props in stories. They are so close to things so cool they simply don’t have a reference point to be amazed by the experiences. My daughter has known our guide and my long time hunting partner virtually all her life. Jared is the one who dragged me into hunting in the first place. One of my closest friends, he’s invited me back to the family farm again. Lauren spent the week with friends an hour and a half south of this wheat field. Jared and I have been experimenting with Maker Bullets suppressed subsonic .308 ammo using Remington 700s and chasing wild hogs for the past two nights. It’s been good. The Pulsar Core FXQ38 thermal clip-on paired to Sightmark Triple Duty 3-9×42 DX scope have worked really well. Additionally, the Bushmaster Minimalist I brought is operating flawlessly, both with subsonic 220 grain 300 Blackout from Team Never Quit (TNQ) and supersonic 125 grain solid copper rounds from Maker Bullets. Seventeen feral hogs are down and accounted for while another four crossed property lines before their clocks finally stopped. This kit rocked for hog hunting! Bushmaster Minimalist in 300 Blackout mounted to a ZRODELTA DCLW tripod. 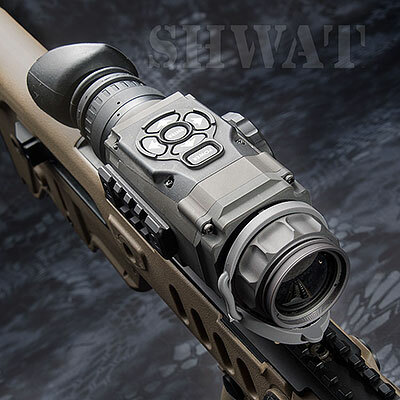 Sightmark 3×9 optic set to roughly 5x and the the Pulsar Core FXQ38 Thermal in Clip-on configuration. Not much later we’re in an enormous field. She’s watching everything unfold through the Pulsar Quantum Lite XQ30V thermal monocular. There must have been fifty or more hogs in that field. Jared and I take out a few and celebrate accordingly. Maybe she sees a hint here that there’s a lot more to the hunt than slaying hogs. There’s a bond, a fellowship here unlike others. She’s now a part, but has a bigger part to play. “You’re up next!” I announce with a grin. In no time at all we spot hogs in another field. Coincidentally, it’s the same field her uncle hunted on his first and only hunt. He scored there one Thanksgiving weekend (read the story here). There’s no time for preparation now, no time to get her oriented to the kit she’ll shoot. The three of us slip through the barbed wire fence and quietly move as quickly as possible a couple hundred yards into the field. Stopping to scan, we decide to close distance another twenty-five yards. There’s only a slight wind, but it’s mostly in our favor. The group of hogs is 125 yards south of us with two sentry hogs closer but east. They are heading north and the wind will soon betray us. We have to make decisions. The sentries reverse course and we decide to move closer. Around a hundred yards we’re satisfied. The moon will be up shortly, it’s really time to engage. Lauren has done well enough, the times when she’s been shooting before. But she’s never used a magnified optic. Right handed, but left eye dominant and wearing glasses, she has to figure out where the eyebox for the Sightmark scope is and adjust the diopter. The focus ring for the Pulsar Core thermal clip-on is at the far end of the Minimalist handguard. She can’t reach it so I rotate the focus ring back and forth until she confirms focus. I collapse the Minimalist’s stock a notch for her and we’re suddenly in business. Jared is keeping an eye on the hogs and running backup shooter should the hogs get aggressive. I’m unarmed. Lauren has the Bushmaster on a DCLW tripod from ZRODELTA (formerly Alamo Four Star). It’s incredibly helpful, but she cannot seem to get comfortable on the gun. The clock is ticking. She has one picked out, but the hogs are moving now. This just got harder. She pulls the trigger, the first time she’s done so in years. The Maker bullet flies downrange, we hear the impact and we have four swine legs kicking up a storm but going nowhere. Game over for this wild hog as Jared and I welcome Lauren to the club! I don’t know if she’ll ever really share my love of wild hog hunting or fully appreciate the nature of using all the toys and tools in her hands that night. Either way, we have a lifetime memory to share of the night she killed her hog. Have a great story to share? Let us know! This entry was posted in Special Hunting Weapons & Tactics™ - The Center of Gravity for Tactical and Long Range Hunting and tagged 300 Blackout, Bushmaster, Hog Hunting, Maker Bullets, Night Vision, Tactical Hog Hunting, thermal by Jonathan Owen. Bookmark the permalink. What a cool experience. It’s not just something that men get to do and I don’t know if your daughter will go do this again, but it sounds like it was a great experience. Great story! Nothing like getting the kids involved outdoors no matter if it’s hunting or fishing! Great story and well written! Taking my 13 year old to Cowtown tomorrow to ring a gong with her new Golden Boy! What a great story! So glad you got to share such an important part of your life with your daughter. They grow up WAY too fast.